According to Tantra, all of creation is a play between Shiva (consciousness) and Shakti (the energy or power of consciousness). Of course, consciousness and its energy are inseparable. This distinction is merely a convenient way to comprehend the incomprehensible. In Shaktism, the ultimate Truth (the Absolute) is seen as the Supreme Mother—the unified background of all existence. This Supreme Deity is equivalent to Brahman in the Upanishads. She is transcendent, ineffable, and immutable. She is the Divine Mother and is venerated in all Her manifested aspects. Tantra is highly ritualistic and implies a reverent lifestyle. However, it is important to understand that the purpose of Tantra’s numerous rules and formalities is to focus the mind, strengthen the will, and deepen the devotion of the practitioner. Rituals in themselves are not the final goal. They are better seen as tools used to reach higher states of consciousness. One of the most beautiful and profound tantric rituals is yoni puja. In Sanskrit, yoni means “source,” “origin,” or “birthplace.” Puja means “worship.” In Tantra, the yoni is an abstract representation of Shakti or the Supreme Devi. It is the creative force that gives birth to and moves through the entire Universe. Therefore, yoni puja is a ritual to honor and worship Shakti, the Cosmic Mother. Without a doubt, the most well-known text on worshipping the yoni is Yoni Tantra. As is the case in many other tantric texts, Yoni Tantra is a dialog between Shiva and Parvati. It reveals yoni puja as a highly revered sadhana (spiritual practice) practiced by kaulas (tantrics). What Does Yoni Puja Entail? Yoni Puja is a sacred ritual whose origins go far back in time. It most probably developed in the Dravidian period of India, when the cult of Shakti was a major aspect of sadhana. It entails the worship of Shakti by performing certain symbolic gestures using an abstract form of Shakti, the yoni—which is represented by a gateway, an oval, or a portal. The word yoni is commonly associated with the female genitalia. However, this can be understood as just a particular manifestation of the creative power of Shakti. Yoni puja can be performed by using a sculpture, painting, or sanctified natural object to represent the yoni and serve as the focus of veneration. Or, the yoni can be worshipped in her living form (the female genitalia). As may be imagined, a form of worship that goes back thousands of years and is still being practiced in India today embraces many forms. Despite any differences, there are several ritual elements with very clear symbolism that constitute the core of a yoni puja. The ritual starts with reverence and salutations in front of the yoni. Those attending a yoni puja will usually offer five different fruits or other items to Shakti—flower petals, rice, ghee, etc. Then, mantras, hymns, and prayers will be uttered for the glory of the Divine Mother. After these forms of adoration comes the consecration of the five elements. In this step, five liquids are poured over the yoni (yogurt, honey, milk, water, and edible oil), representing the five elements (Earth, Water, Fire, Air, and Ether). This offering symbolizes the sanctifying of the five elements. The five liquids are collected in a vessel below the symbolic yoni. The final mixture is empowered by the direct and intimate contact with Shakti. Afterwards, every participant to the puja takes a sip of this sacred libation. After the sanctifying of the elements usually comes the “magic stage.” This is a time that worshippers kneel before the symbolic yoni and ask the Cosmic Mother to grant wishes. Wishes may be of any kind—“please cure my mother,” “please give me a child,” “let me have success in business and increase my earnings,” etc. For the genuine spiritual seeker, of course, the “wish” that naturally springs forth from the Heart is to realize the Truth, to go back to the Source, and find the Essence of creation. Thus, by the synergy of devotion and grace, the true practitioner is absorbed in the “womb” of the Mother—contemplating the mystery of Shakti, going back to the Source. What is most important in a yoni puja is the single-minded attention of the practitioners and their devotion to Shakti. It is this combination of awareness and love that enables the consciousness to rise during rituals. I emphasize the crucial aspect of being deeply in love with and reverential to the Mother in all Her forms. Women are multiple facets of the Supreme Shakti. 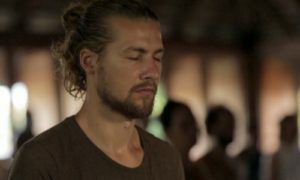 Antoaneta is a senior Hridaya Yoga teacher. You can read her post about Tantra here. Is Lajja Gauri a representative of this ?